So, as folks have probably noticed, I don’t play World of Warcraft all that much anymore. This website has languished for an entire expansion or more, and I’m not sure that even my best intentions will revive it. I’ll tell you, though. 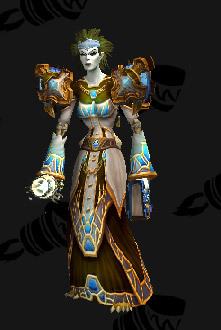 I’m loving those playable Nightborne, so there’s hope for this website yet. In the interim, unfortunately heavy traffic (I’m guessing from folks direct-linking to images) is adversely affecting the site’s usability so I’m taking down the screen captures of each set by race. Links to each set on Wowhead remain intact so you can generate your own preview using your race of choice over there. Check back over the next few weeks for more sets, the creation of a demon hunter category, and some discussion of recent transmog changes. In the interim, monks! 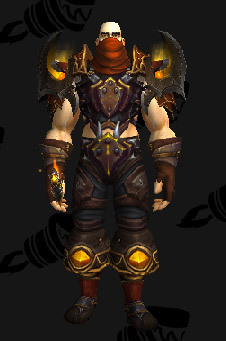 This burnt orange leather transmog set is locked to the practitioner of the monkish arts (is that a thing — we’re going to say that’s a thing) but you could probably work something similar with different shoulders for other classes. I don’t keep this website updated as frequently as I should (on a related note, watch this space for updates on Legion’s leaked gear and weapons models sometime in the next decade), so it might surprise you to hear that I build some of these sets weeks, if not months, before they’re posted. Why the delay? Honestly, formatting the posts and making the screen captures takes time I sometimes just don’t have. So the sets sit there, waiting patiently, for the day I’ll go through my drafts folder and go, “Oh yeah, that’s a thing,” and send it out for the world to enjoy. That’s what happened this morning, except wasn’t so much, “Oh hey, check out the deft craftsmanship that went into this handmade transmog set I made several months ago” as, “uh, wait… why.” Like, the helm and the bone-coloured belt make sense, and even the shoulders could work in theory, but with the shoes and the dagger I’m kind of left scratching my head. Maybe somebody spiked my coffee with more LSD than usual that day. Anything’s possible. 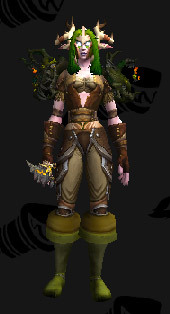 So consider today’s transmog set a risky experiment. I think it looks good on night elves, but other races will find their mileage varies considerably. If you guys have ideas re: a better weapon or shoes, hit me up in the comments. Am I the only one who thinks Shoulders of Foaming Fluids sounds, like, super gross? Because ew, you guys. Ew. Feeling disaffected with your government? Tired of envying your fat cat neighbour’s plush new cardboard box to sleep in or choking down your mama’s homemade dirt-and-stringy-coyote-hair pie? Come to the Deadmines, where drifters and deadbeats and layabouts are forged into lean, mean, drifting and deadbeating and layabouting machines. Can’t find a job because the fields are bare and the guards at Sentinel Hill don’t like the way you smell? The Defias Brotherhood offers ample training opportunities to its members in the lucrative fields of thieving, stabbing, and general rabble-rousing, all for the low, low cost of being slaughtered indiscriminately by rampaging hordes of low-level Alliance adventurers. 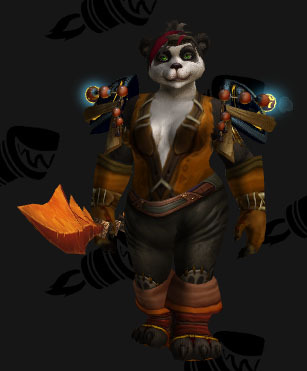 So far as this leather transmog is concerned, it’s “bring-your-own-bandana,” though. Do we look like we’re made of money?